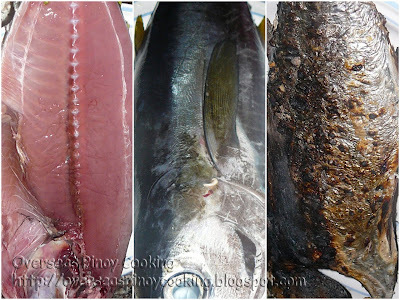 Inihaw na Isda or any other seafood is my favorite fish dish, Pinoys love anything grilled fish or seafood. From the simple straight to the charcoals to the more elaborate wrapped in aluminum foil with onion and tomatoes like the inihaw na bangus or the marinated grilled tuna. Today I just have inihaw na tulingan just season with salt to taste. I have selected a medium size skipjack tuna I wanted it grilled whole but I did not want to have and overcooked outer part and raw inner portion beside I wanted it cooked as quick as possible. To do the trick I ask the fish monger to cut the fish in half along the fish bones along the length of the fish, this way the fish could be cooked a lot quicker. Do not overcook as grilled tuna will tend to get firm when overcooked. This could be served with your favorite dipping sauce. I prefer it dip in fish sauce with kalamansi and a couple of hot chilies. Enjoy. Ask the fish monger to cut in half along the bones from head to tail of the fish. Remove gills and innards and wash fish thoroughly, drain. Rub with salt. Grill in charcoal for 10 to 12 minutes on each side. Do not overcook, inside to be just cooked. Serve with a dipping sauce.